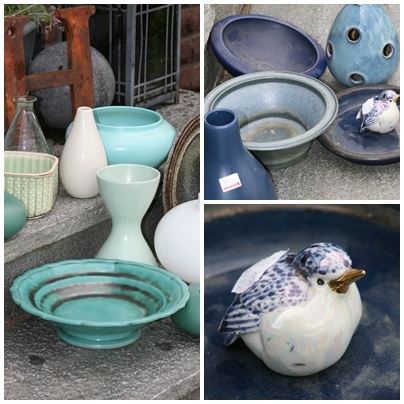 What a fabulous day I had on Saturday at one of my favorite thrift stores here in Gothenburg, Sweden. If you didn’t hear about the “I <3 Thrifting" event this year, it was such a great success that I am sure Mr. Goodwill Hunting is already planning for 2012! 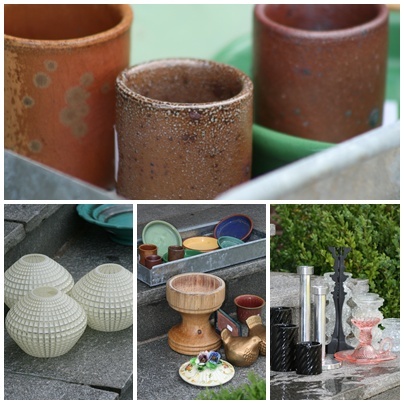 And it was fun to know that many other thrifty kindred spirits like The DIY Showoff, In My Own Style, and Nesting Place were also out there in their own respective cities – not to mention Mr. Goodwill Hunting, himself! And I came home with a stash of fabuloso finds! And I already have inspiration for what to do with my treasures – so make sure to follow all the way down and have a look. Pottery was what caught my eye on this outing. Particularly in shades of blue. I absolutely adore the pantina on these little clay shot glasses. I came home with glass light globes, small planter bottoms, misc. pieces, and some candle holders that are going to be fabulous middle supports for some unique tiered cake stands. Now, this one is presenting me with a real dilemna. I purchased it for about $15 because I wanted that blue frame for a known project. But call me crazy…in only 1 day this fabric painting is really growing on me. It is done by a Swedish artist (at least the sig is a Swedish name), but my Swedish hubby says it isn’t traditional Swedish design – more likely something from Eastern Europe. But the colors are fab…and it is such a nice oversized piece (about 4 feet tall). Help! What do you think? Keep this painting? Or use the frame to make my husband’s 10-year anniversary present – a painting (by me) inspired by this longitude/latitude idea? Most pizza joints here serve a thin crust pizza, meant for one. 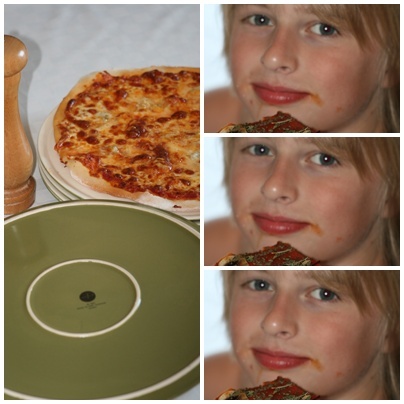 How fun that we found these nice large round pizza plates from Sagaform. Check out their ‘very Swedish’ designed products. It inspired us to make pizzas from scratch tonight. NOW…on to the inspiration! I’ve got plans for most of what I brought home. These are not finished projects…but just playing around to show you what I’m thinking. 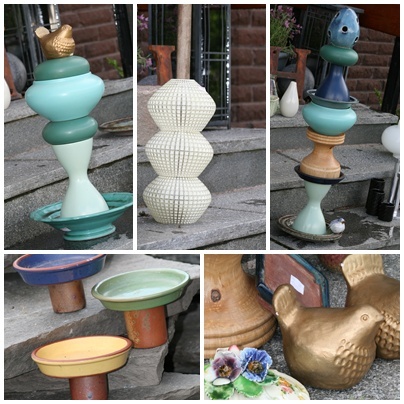 I’ve got garden towers on my mind, inspired by those I’ve pinned on my ‘whimsical garden decor’ board at Pinterest. Have a look! The ‘shades of blue’ pottery will make 1 tall or 2 short garden towers. Those cute little lamp globes (center) will start stacking on an old broken broomstick and become a tall tower of glass goodies. The little pottery planter bottoms will sit on those cutie pie clay shot glasses on some kind of natural stone…and serve as little bird baths and feeders. 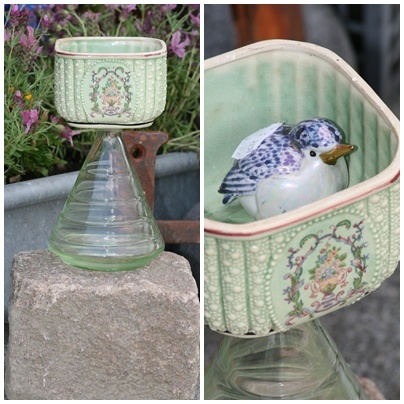 And last but not least, I think this one will be a pretty simple bird feeder…the glass vase with a little porcelain vase on top…and an extra surprise tucked inside for when the birds come to visit. Whew! What a great day that was. I’ve put together a fun little video about my thrifting day and I hope you’ll have a look for a little thrifting inspiration. Feel free to shop and tell me if I need to go and pick you up anything! Love the painting, but as one who needs to also finish projects, if the frame is perfect, use it as planned. I actually think the paining cries for decoupage – like the front of a double-doored cabinet, or on a table or filecabinet top protected with glass… Love your projects – they're inspiring! I like the painting! and I'm so jealous of all your junk yards and can't wait to see the whimsical garden tower thingy's!….love that! I really like that painting. 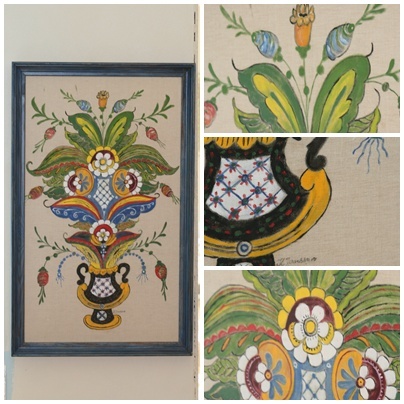 You can find another frame….. that painting is so Swedish and such great colors!!!! Keep it keep it keepit! Where was this thrift store? Why did I NEVER go? 10 years wasted! What a store – WOW it must take a long time to go through it all. The video was a great idea. I will have to remember that for next year. It is fun to see that even way across the Atlantic, there are thrift stores Mega Ones!. Thanks for sharing your day and treasures. I love the pottery tower you made and I love the painting the colors are so vivid. I am looking forward to doing it again next year.